Depicting the life and many triumphs of Artemisia, the queen of Halicarnassus, this piece Les Herauts tapestry is part of a set. Famed from her bravery in battle, Artemisia was said to have fought like a man while the rest of her warriors fought like women during the Battle of Salamis in 480 BC. Marie de Medicis, who was queen consort of France in the 15th century, commissioned this tapestry. The tapestry shows the heralds calling the troops at the queen’s command. Artemisia is shown at the front. It is a symbol of her bravery, nobility and intelligence as a commander of her people. 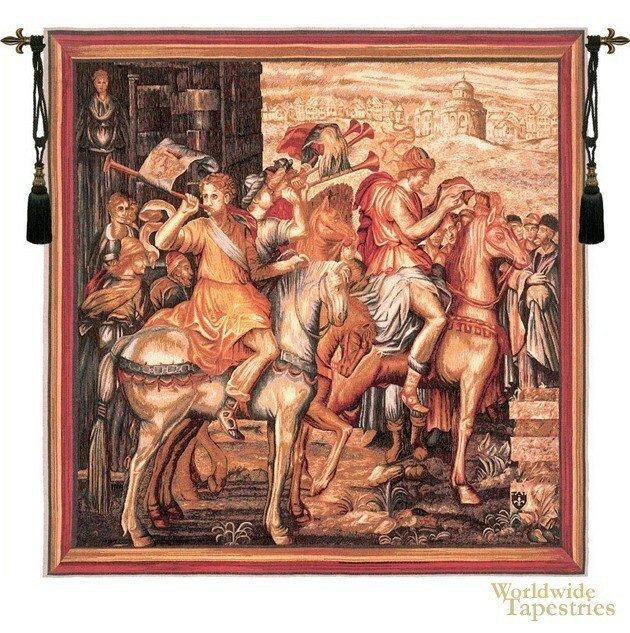 This striking tapestry brings history into your home in a stunning palette of color and outstanding detail. Les Herauts tapestry is lined and comes with a tunnel for easy hanging. Note: tapestry rod and tassels, where pictured, are purchased separately.